Contact lenses are complex materials that must provide a range of physical properties in order to be effective, safe and comfortable to wear. These properties include: (1) high oxygen permeability in order to transmit O2 to the cornea, (2) hydrophilic surface so that a continuous tear film coats the lens providing lubrication and (3) resistance to bacterial and protein adsorption. Understanding both the surface and bulk chemistry of lenses is critical to engineering optimal performance. 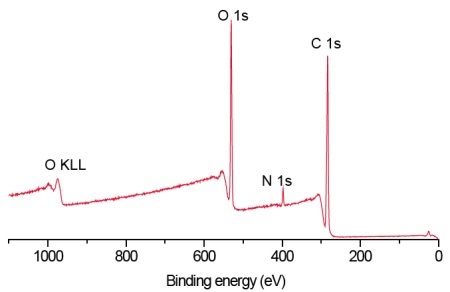 The combination of surface sensitivity (0-5 nm sampling depth), standardless quantification and ability to detect not only elements but also functional groups make XPS (X-ray Photoelectron Spectroscopy) a powerful analytical tool for determining the near-surface chemistry of these materials. 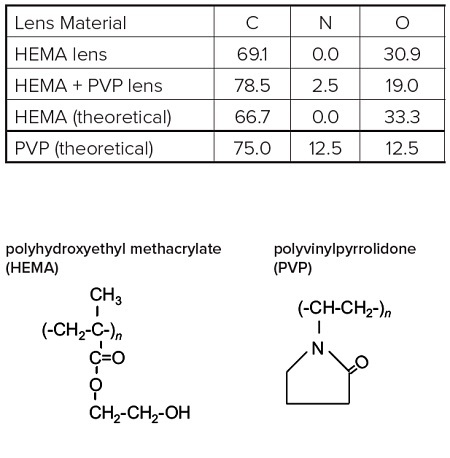 Survey scans below show a common hydrogel lens material (poly hydroxyethylmethacrylate (HEMA) without (Figure 1) and with (Figure 2) the incorporation of a hydrophilic polyvinylpyrrolidone (PVP) co-polymer. It is clear that XPS can detect PVP based on the nitrogen in the PVP-containing lens. For the pure HEMA lens there is excellent agreement between the observed and expected elemental concentrations and the carbon 1s spectrum (Figure 3) indicates a pure, uncontaminated lens surface. PVP is added to the second lens to improve the tear wettability of the lens surface and so it is important to be able to quantify the fraction of PVP at the surface. This is done by comparing the observed nitrogen concentration with that expected for pure PVP. Lens 2 contained 20% PVP at the surface. 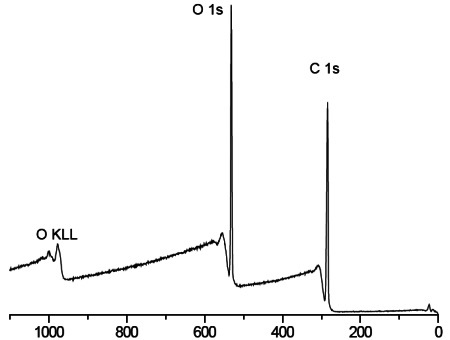 This result is confirmed by the presence of a O=C-N peak in the carbon 1s spectrum (Figure 4). Figure 3 Curve fit of high resolution carbon 1s spectrum from pHEMA lens. 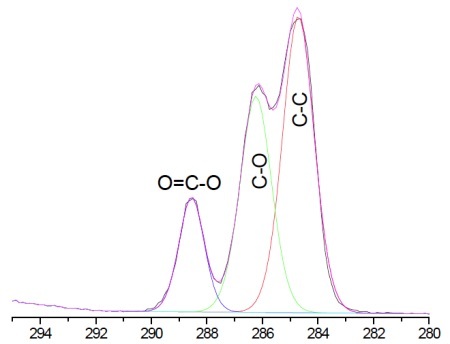 Note the 2:1 ratio of C-O : COO consistent with known HEMA chemical structure. Expected concentrations are [C]=66.7% and [O]=33.3%, in excellent agreement with Table 1. Figure 4 Curve fit of high resolution carbon 1s spectrum from pHEMA-PVP lens. 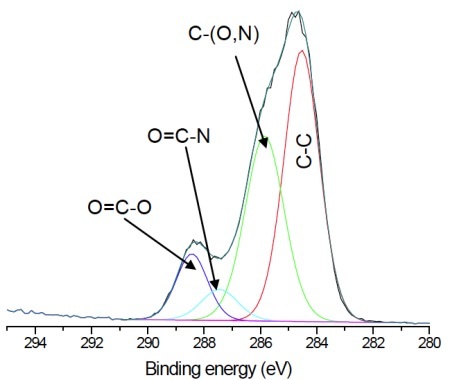 Note the O=C-N component at 287.4 eV indicative of PVP (and absent in Figure 3 above).